*Note: this essay, obviously, discusses animal death. Sensitive viewers are advised to be cautious. During my college years, I worked for an environmental consulting company for a summer that was mist-netting for bats. 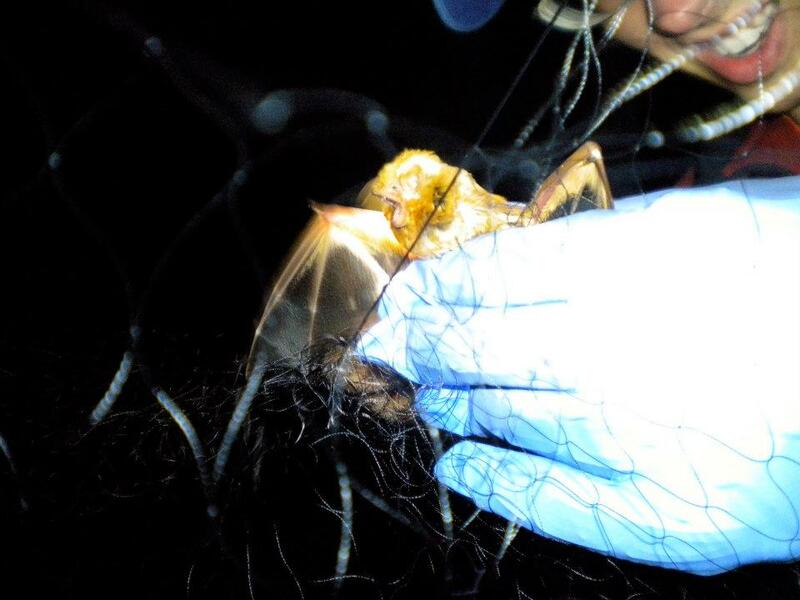 If you have never mist-netted for bats (or birds), well, it can be quite a treat. Technicians set up delicate, nearly-invisible nets within gaps in the canopy to catch flying creatures unawares. The purpose of this is to be able to quickly identify and survey what is flying in the area in order to study them; the animals, sparing any accidents, are then released unharmed. One of the unwilling subjects of our study. 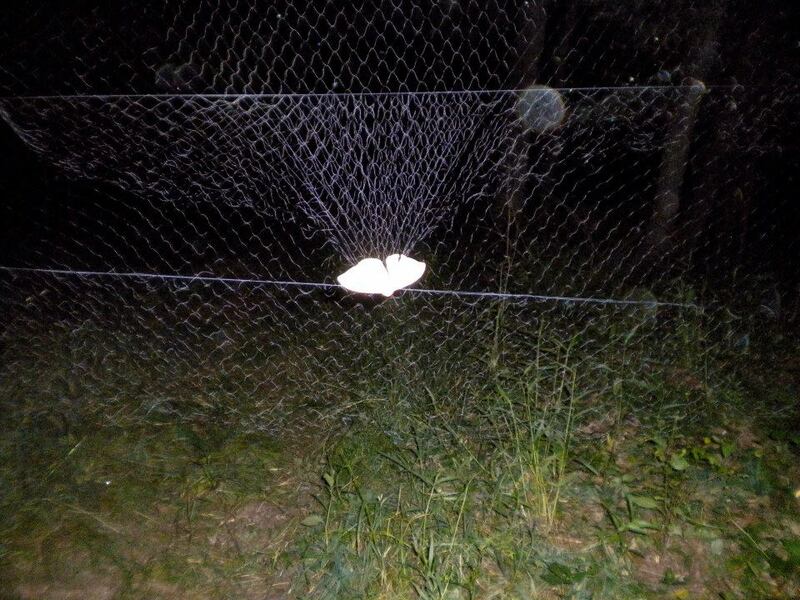 Since we were mist-netting for bats, we had to set up our nets at night, of course, and our nets occasionally caught other flying nocturnal creatures besides bats. We caught flying squirrels on occasion (don’t let their cute looks fool you, they bite far harder than any bat) as well as catbirds and even small owls. But the most frequent unwanted guests in our nets were giant nocturnal moths. 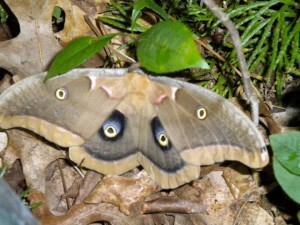 There was the occasional giant, gorgeous luna moth, but more common were brown polyphemus moths and yellow imperial moths. Both of those species are still quite striking and have a wingspan than can surpass the length of my palm, so I have to admit that I was enchanted when I first saw them. And when they got caught in our nets, I wanted to free and release them. This was not what most of the biologists and technicians mist-netting for bats did, and a few scoffed at my attempts to rescue the insects. The problem is that it is much harder to detangle a soft-bodied insect from a fine net than it is to detangle a vertebrate with flesh propped up by firm bones. 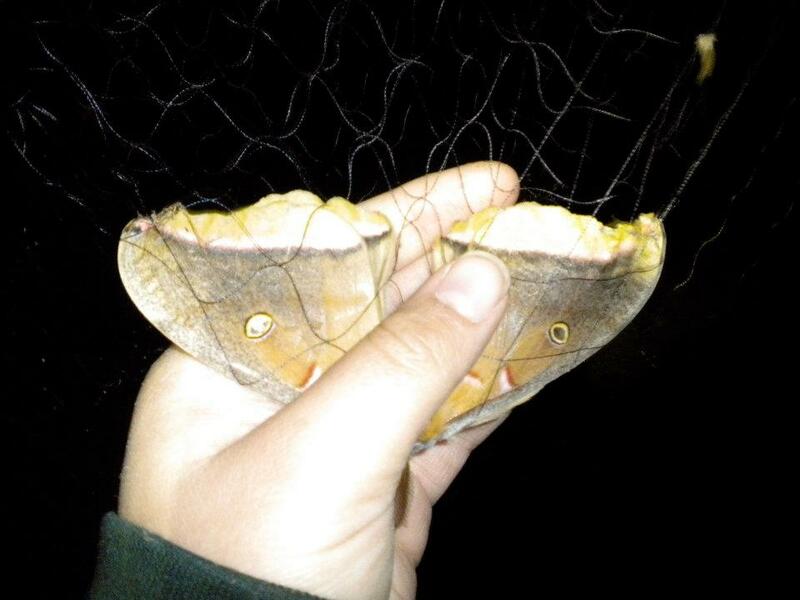 Removing the moths from the nets was time-consuming and inevitably they would come away wounded at best, with many scales missing from their glorious wings due to incessant flapping. An imperial moth caught in one of our nets. 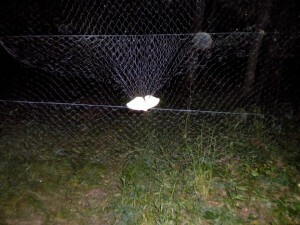 My enchantment with the giant moths waned rapidly as I spent more time mist-netting. Their struggles alerted the bats to our nets, driving them away, and on some nights our nets would simply be full of bright flapping wings. And they tended to reward their rescuers by slamming straight into their faces. I regret to say that I only spent a few nights freeing moths. After a while, I began doing what the more experienced techs and biologists did: I ripped them out in pieces. It does not sound pleasant, and it was not: I still remember the dreadful popping sounds. And the first time I did it, I was actually sickened by myself, watching the halves of the moth that I had destroyed flap vainly on the ground in the throes of death. One of my final rescues pictured here. But that was the first time. As it got later in the season, and we grew busier and busier- netting twenty, thirty, forty bats each night- the removal of moths became methodical. I bring up this anecdote because it is a good example of animal death becoming casual. 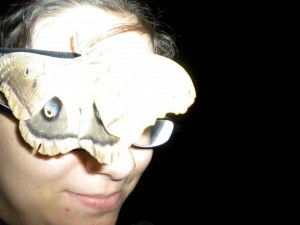 Moths are indeed animals, and very attractive ones at that. To have killed so many of them at a point in my life feels very disturbing. 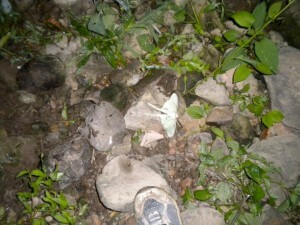 I certainly would attempt to free, rather than crush, a moth that I found caught in something now. Why the change? Because I find them less annoying when they aren’t interfering with my work? But isn’t a life a life, no matter the circumstance? But here’s another wrinkle to this tale. That same summer, I killed hundreds of mosquitoes without a second thought. Both moths and mosquitoes are insects: but only killing the moths feels bad, because they are attractive to my human eyes. Our perception of death, I think, changes constantly. As I mentioned before, we obviously want to believe that a life is a life no matter what. Yet it is difficult- I would argue impossible- to follow through with this credence. So if all lives aren’t equal, which lives do matter? Most restrict it to animals, ignoring plants, fungi, protists, archaebacteria, and bacteria- even though all those groups combined make up the vast majority of life, of which animals contribute just the tiniest sliver. We believe that animals have more of a right to live even than plants; this is obviously due to our own bias and perceptions. A series of deer vertebrae I found embedded in the ground. But fine, let’s limit it to animals. We still give some animals more allowances than others. 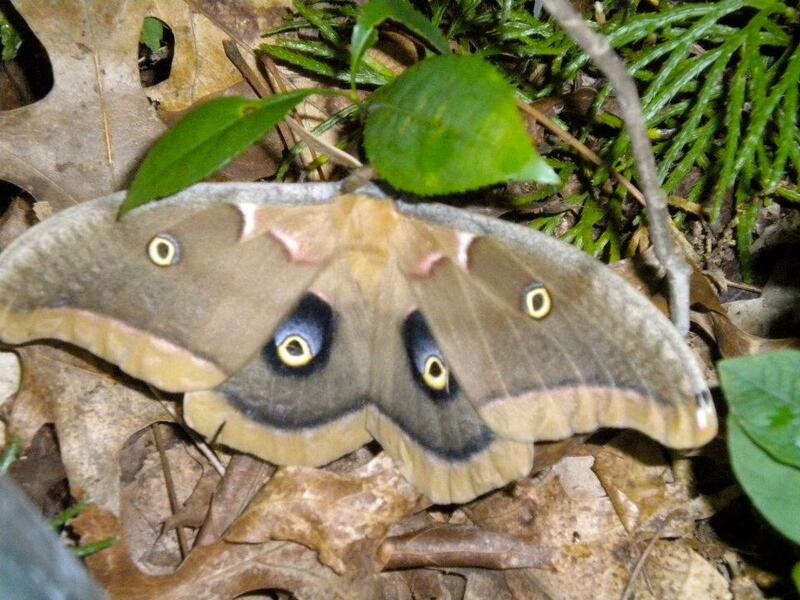 Moths deserve to live more than mosquitoes because they are more attractive and usually don’t bite us. Vertebrates deserve to live more than invertebrates (with the exception of the charming octopuses and other cephalopods) because they look and act more like us. Furry vertebrates get precedence over reptiles, fish, and amphibians… and so on. At this point you could bring up the fact that some animals have a greater capacity to suffer than others. A bear, for example, is capable of feeling more complex pain than, say, an earthworm. 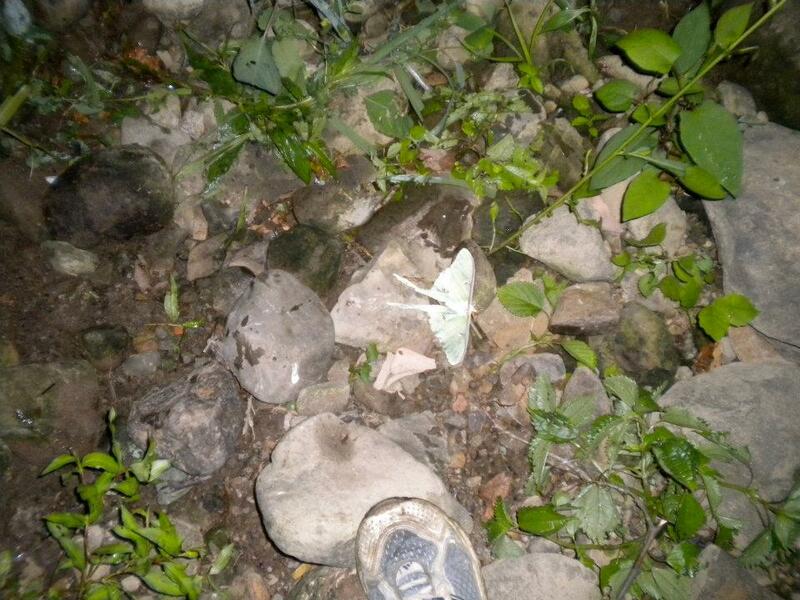 A luna moth, battered from an encounter with one of our nets. So while we can argue a great deal about suffering and the proper contexts that animals and others deserve to live their lives in, death is separate from all that. Death can result from suffering, it’s true. But it’s also true that we often euthanize our pets to stop their suffering. As Gavroche said in Les Misérables, “Everyone’s equal when they’re dead.” So, again: if a mosquito and a chimpanzee experience death in the same way, is it really right to value one life over the other? From a biologist’s point of view, yes. It is a factor of numbers: the mosquito population can survive the losses of thousands upon thousands of individuals each summer, but not so the ape population. But in this scenario, based upon populations, the right to life of any individual is totally erased: all that matters is how many there are in total. This would be terrifying if, say, we ever applied it to human populations (and in fact, across history, we have). 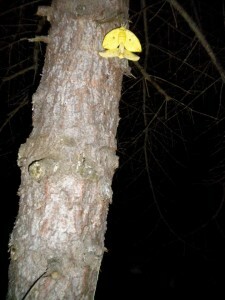 A pair of mating imperial moths. I’m not in favor of advocating for any lethal human-population control measures myself. Of course I’m not, I’m human too! And I think most humans would agree with this. But the problem is if we then try to apply this same rhetoric to the lives of other animals: simply put, we usually can’t follow through. I think we all have to admit that we are biased. And I don’t think that our bias is necessarily a terrible thing. One of my early rescues rests momentarily on my face. I don’t know whether valuing the life of an individual mosquito over the life of an individual human is really right or wrong. Right and wrong are quite frequently hard to discern; especially when you realize that there really isn’t a user’s manual on morality. But should we feel ashamed if we value human life over animal life? No, I don’t think so. I think it’s a factor of self-preservation; it’s who we are. And we value the lives of animals that look, act, or think like us more than those that do not because of this sense of self-preservation. Because if we apply death to these individuals, it feels only a step away from applying death to ourselves. It stems from the most primitive type of morality: empathy. But our empathy is rarely fixed firmly in one place. When I was busy and the moths got more annoying, I killed them; otherwise, I did not. My sense of empathy was totally dependent on the circumstances, and it’s a little terrifying to realize. When is a death a casual death? When is death excessive, and when is death acceptable? We all need to admit that the answers to these questions are constantly changing. And I hope you didn’t read through this essay expecting me to give them definite answers: I cannot. If you think you can do it, kudos to you. Perhaps, though, rather than considering the cost of death to the dying animal, we should focus more on what that death gives to the survivors. A mosquito, as far as we know, will not mourn for one of its smashed brethren: but the loss of a matriarch will shatter an elephant herd. 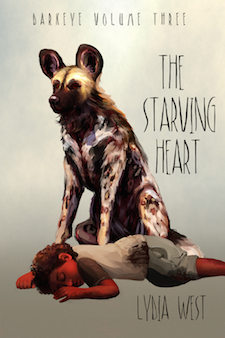 Conversely, the deaths of a few hundred overpopulated deer might alleviate the suffering of their starving, disease-ridden brethren. Yet this is not still not flawless, because we can’t apply it to humans. We still have to be biased: I think it is wrong to say that a human with no family deserves to live less than a human that would have a hundred mourners at her funeral. But who really knows? Again, I don’t claim to have any answers, though I think the most probable one is our inherent need for self-preservation. And honestly: is it wrong? I am sorry about the moths I killed, though. 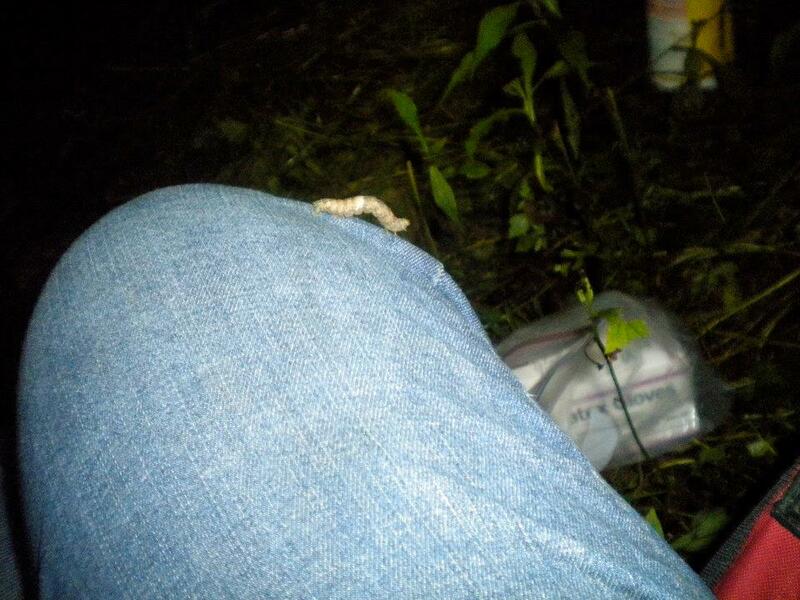 A caterpillar, species unknown, dropped onto my knee. I let it crawl away unharmed. *Ok, not totally. Sometimes it is hard to define death when, say, an individual has their heart transplanted; similarly, organisms can swap cells and pieces of themselves all the time and how do you even define life, for that matter?? Is it just DNA? Are viruses alive? **It’s interesting that I wrote this article with such a firm concept for what death is, yet now I can’t even come up with a proper definition of it. Well, I’ll see myself out. I think that a definition of ‘life’ does not exist in language. There is no set of criteria that everyone can agree upon to determine if something is alive, because when we’ve whittled our list of criteria to the bare minimum, we find organisms that don’t quite fit but a niggling little voice in the back of our heads says ‘ehh… that looks alive to me’. The same goes if we’re more inclusive in our list, because then we begin to include things (like robots) which really just don’t feel alive to us. We’re trying to use words to define an intuitive concept here, and our language simply isn’t built to do that. We’re very good at identifying to ourselves which creatures are alive and which objects are not, but our ability to do this has no relation to the ‘real’ world (or if you, like me, have issues with the word ‘real’, the world which we’re trying to discover with science). I could compare it to a child trying to classify objects in her toy box as “Borogoves” or “not Borogoves”. She does it with apparent ease, but obviously “there’s no such thing as Borogoves, darling”. Similarly, “life” doesn’t exist independent of the human brain. When we feel like we’ve examined something closely, and it feels alive to us, it’s jolly well alive. 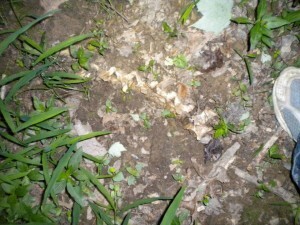 When something looks dead to us, it’s dead. “BUT!” says the voice of every lecturer I’ve had on the subject of viruses, “ARE VIRUS ALIVE?!!? !11shift+1?” My answer is, “I don’t care”. We’ve discovered things that are impossible for anyone who lives in a purely macroscopic and very small world to know about, but most of the time our intuitions are founded precisely upon such a world. Our intuitions about life don’t work on things like viruses, and our intuitions about species don’t work on ring species. Is it important at all if viruses are alive? Not to me. It’s okay for things to not fit into our intuited notion of the world, that’s what makes science exhilarating. I love the fact that you’ve identified the most primitive type of morality as empathy. To me, empathy is the only rationally justifiable morality. We’re terribly biased, and that’s okay. In one moment we can feel morally at ease about something, in the next we may be tortured by it, and that’s okay. We’re a mess, and I love it. Damn, that was a well-written treatise. The idea of something mattering is essentially a mental construct, though. Something matters simply because we attribute value to it, and the only way we can measure it with our sense of bias and values. Beyond what we mentally designate to the events of something living becoming dead, and the ecosystem effected, the impact and influence is strictly only really the impact and influence that we attribute it….and, well, our bias towards death and things dying. The only process, presence, or whatnot that really ultimately matters is that whatever keeps the universe running will keeps doing so, and even that is something that is attributing a technically unnecessary value when you think about it. It might sound like this is sidestepping the question, but I think it’s worth asking oneself what the concept of something ‘mattering’ supposed to be in the first place. If something matters, it’s something relevant to some desire, goal, or the like, isn’t it? Fulfilling some sense of value or judgement? It’s stuff that external forces are dictating in the end of the day, no matter what. Even a completely divine influence would technically still be external and roughly arbitrary. Sure, if there is a God, and some deer’s life was important, it would be important… but only for that God’s whims, and the whims of anyone who would end up caring for some cause or another. Life itself is a technically meaningless segregation in a lot of the same way. Until we find out otherwise, life is just one event and process in a bunch of events and processes in the universe, and we just want to make something out of it because a sense of appeal and closeness to the autonomous way it works. If minds are a separate existence and there’s souls or something? In the end it’s just another bunch of processes and materials, just decisively more exotic. This is ultimately why finding out whether something is alive or not, and finding morality in death and suffering or not, is so hard. As much as you may want to throw out bias and such, the artificial ruleset that we’re working with is literally the only reason that it’s anything more than a complex equivalent of ‘fire burns a candle wick’, or ‘the light illuminates the place’, and so on. The confusion and guilt is just that we’re not sure whether our system is working the way we built it towards, and how the disobedience is flaying at the whole thing. Maybe I’m elitist, but I can’t discern it working as being anything but this. It may sound bleak, but I think that’s what makes it important and wonderful. Things matter because independent of some required process or important objective, there’s a sense of relevance. The reason that it’s all cold and horrible is that because the importance is designated by being a mere requirement or not of some absurd check list that is ultimately absolutely apathetic. However, the animals of its community, the people who kill it, and everyone else put down that it’s valuable and that it matters to them. The meaning transcends the mundane because the living turns it into something more than it is. So what if it’s derived from this base instinct and that relative rule, and whatnot? That’s part of the literal structure of how we are able to relate and determine values in the first place. It’s part of how our minds run. If you’re going to nitpick and break it over the lack of holistic and transcended mentality, then quite frankly, I’m not quite sure there’s anything sufficiently sacred and detached from the apathetic checklist that it would be possible to designate any sense of meaning. But, you know, as certain as I feel…in the end of the day, that’s just my two cents. See, the concept of life is an interesting one. And in many ways for us humans, exactly that- a concept! As humans, and living in societies that had a huge part in conditioning (although of course not on purpose) this over the years, we tend to see things in a very absolutist, dualistic way. Life- death, natural-artificial, good-bad. But as you say perhaps that is not the case at all! Those concepts seem to not fit with what life is when the actual experience is compared to them. For example there are arguments over where life starts in humans, but aren’t even the gametes in some way alive? Of course they are not a human and are not alive in the way we see ourselves alive, but nonetheless, we aren’t robots that have been all up and finished and booted up with consciousness with a press of a button. In the same way viruses, are in some strange land between being alive and not alive. So I think life is much more fluid than we see. For the moths, I am sorry. In life it so happens that lives are going to be lost. If I can, I want to preserve the ones that I can from simple empathy of the desire to live (and perhaps the awareness that once a life of an individual is lost it is lost, no matter the numbers) be it a moth or a human. But as I’ve said before, life is not absolute. I don’t think anybody needs to feel guilty about killing a fish or a chicken when in need of food for example. It can be a tough subject to discuss but I think indeed circumstances and the natural world is to be observed with inquiry rather than clumsily squeezed into our, often flawed, concepts. I pretty much agree with all that you said. I feel guilty when I kill a bug, but not as guilty as I used to feel (I guess we get used to it after a while). I still try to not kill it, but it is incredibly hard. When there’s a spider in my bedroom, I put a cup on top of it, slide a sheet of paper under that cup and then remove it (sometimes this takes up to 10 minutes). I really do value insect lives, even though they still creep me out. But sometimes I wonder if I’m just being crazy. If it came down to a human dying or an insect dying, I think we would all choose the insect. We have no way of knowing how much the insect feels or is aware of, but we have no way of knowing so we assume it’s not much, probably because this makes us feel better. And what if in your attempt to help an insect, you end up hurting it? Do you put it out of its misery? Or do you leave it there to die? There are so many things that we do without questioning if they are okay to do, like squashing bugs or buying lipstick tested on monkeys, simply because everyone else does it. Even once you open your eyes to the impact that your decisions make on other lives, it is very hard to always do what’s best for non-human lives. I personally do my best to be conscious of what I am doing and its impact, but I’m not perfect. I won’t buy genuine leather, but I know that when I use paper its made from trees. I try to buy cruelty-free products, but the truth is that most products are still tested on animals/benefit from third-party testing. Dr. Seuss wrote “even if you can’t see or hear them at all, a person is a person no matter how small”. I think that applies to non-human lives as well, and as the animals with the most power (because of our technology), we need to do the best that we can to protect these non-human lives.